The very first step will be to extract the NTDIS database from the domain controller. If you have admin access to the DC it is easy, if don’t you can use Metasploit or some other techniques. In our example, we have access to the Domain controller so we can use the native tools to create a snapshot and copy NTDS. 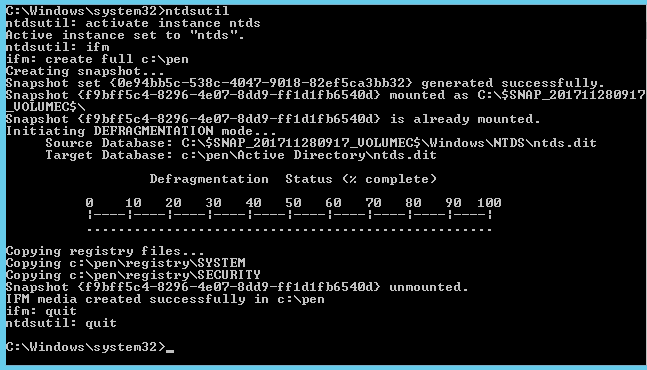 Log in to your server using admin account, open a command prompt and start ntdsutil. This entry was posted in Uncategorized by bisser.todorov. Bookmark the permalink. Copyright © 2019 IT Solution. All Rights Reserved.